One of 1time Airlines' planes embarks on its final voyage. All 1time planes were grounded soon after. Low cost carrier 1time Airline announced on Friday, 2 November that it had suspended its operations and that all of its planes had been grounded with immediate effect. “Our business rescue practitioner has advised that there are no reasonable prospects of survival as a potential financier notified us this afternoon (November 2) that they are no longer able to invest in our airline. 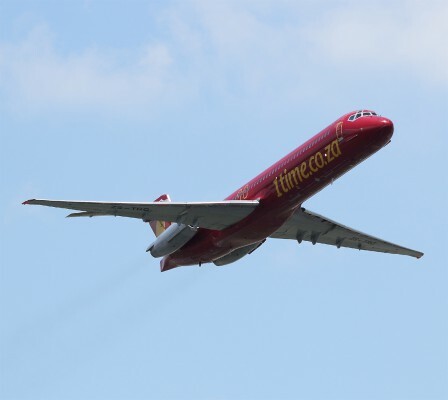 It is, therefore, with regret, disappointment and heartfelt disbelief that we have to terminate the business rescue and file for liquidation, which means the end of a dream and an era for all of us,” said Blacky Komani, CEO of 1time Airline. 1time’s business rescue practitioner has sent out a notice to all creditors and will finalise all outstanding matters in the weeks to come. “Although 1time ceases to exist, the airline that we’ve built up through blood, sweat, tears and undeniable passion, will live on in the hearts of our passengers and also our competitors, who know that they have lost a formidable and world-class player in the low cost market,” Komani said.